Jim Cummings' Sundance winning short gets the SXSW-winning feature expansion it deserves. Those fortunate enough to have seen Jim Cummings' Sundance winning short film, Thunder Road (2016), won't soon forget it. Some found it hilarious, some found it awkward, some found it hilariously awkward, perhaps in the vein of human train-wrecks like The (UK) Office’s David Brent. Some just found it sad. I personally think the genius of the endeavor lies in its ability to juggle all of these tones and dance an impressively fine line between its own unique brand of comedy and tragedy. But more than either of these polar emotions, what’s on display in the short is an empathetic expression of grief-stricken humanity so rich it renders its audience speechless. In its single take, the short is so pitch perfect it makes you wish its writer/director/star would just leave the damn thing alone and focus his feature debut efforts on something else. This is a very real fear I had going into Thunder Road (2018), which has the audacity to re-present its perfect single take and keep going into the day to day of Jim’s unravelling life, beyond the fleeting revelation(s) that arose from an embarrassingly personal display of emotion at his mother’s funeral. Born and raised in Texas by a single mom, Officer Jim Arnaud is a true grit cop... at least he tries to be. Despite his heartwarmingly good intentions, lately things have been trying. Begrudgingly falling in his mother’s footsteps, Jim is a single parent. He became one when his unwholesome wife left him over a year ago. Now her new boyfriend feels that sole custody of Jim's daughter is warranted… What with Jim’s “emotional problems”. This is not how life was supposed to play out. And now, while battling an actively diminishing outlook on the American family, Jim has lost his mother - his sole caretaker. He's grieving, but he doesn't know how. It’s likely that he doesn't even know why, exactly, or at least he can’t begin to grasp the half of it having spent life proceeding on a need to know. Processing one’s emotions wasn't exactly a family tradition and consequently Jim is ill equipped to handle something as heavy as losing his mother and all the connotations of 'too late' which that entails. At her funeral, Jim wants to pay tribute to her lifelong passion for dance, as well as her universally youthful notions of the escapist romance of the open road, à la Bruce Springsteen, but he fucks it up. He's been doing that a lot lately. He deserves the modest things he asks from life, only to repeatedly learn that it doesn’t work that way. He's desperate to get life right, but the stakes are growing too high. And now his daughter is on the line. Sadly, Jim isn't the type of person who asks for help, so he doesn't and things get worse. Things fall apart. 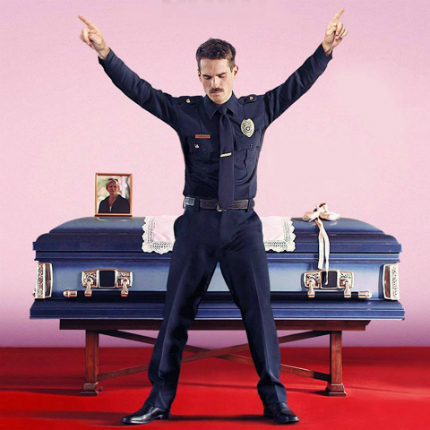 Like the short film, Thunder Road is funny. Very funny. Similarly it's also messy, cathartic and downright heartbreaking. Cummings, who has recently made an ongoing practice of the long take, continues along these lines without ever being showy about the device. He’s able to execute his perfectly constructed script of broken dreams and actively breaking hearts thanks to sharply modest filmmaking. Brimming with smart cinematography and editing, the film is immaculately presented, yet it would fail completely if not effortlessly brought alive by its players; a charming ensemble cast of sweet souls inhabiting a sweet world tainted by the cruelty of circumstances. Inevitably, it's a work that treads on tender territory - processing turbulence, ‘dealing with it’ - unsafe ground that isn’t particularly easy to consider - especially when it happens to you. But it does happen. Rock bottom is nothing if not sobering and death has a way of bringing out those lurking elements in a person capable of unravelling one’s entire foundation. How we as a species fathom the unfathomable is an incredibly personal and flawed experience. Vulnerability isn’t conducive to inclusion, yet Thunder Road is that rare breed of film that exists to console. It’s a film that feels ‘there’ for you and you can’t help but love it for that, even if your impulse is to run. Review originally published during SXSW in March 2018. The film will open Friday, October 12, in select theaters across the U.S. Visit the official site and/or official Facebook page for more information.